The award-winning musician is showing that he truly has a "24K Magic" heart of gold. Bruno Mars once sang that he's "a dangerous man with some money in my pocket," in his song "24K Magic," — but it turns out, he's also an incredibly generous man who just wants to help a bunch of people in need. 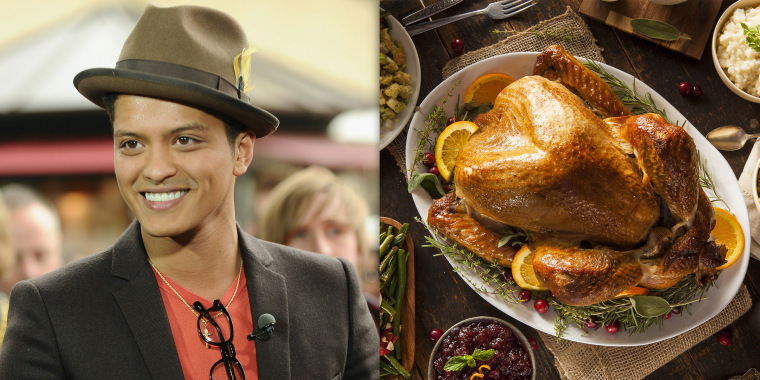 The Grammy Award-winning musician is planning to give away Thanksgiving meals to 24,000 people in his home state of Hawaii, the Honolulu Star-Advertiser reported on Sunday. Mars will be providing the food via a donation he made to the Salvation Army — Hawaiian & Pacific Islands Division's 48th annual Thanksgiving Dinner meal program. "We are humbled and honored by this generous donation from Hawaii's own Bruno Mars," Salvation Army Major Jeff Martin said in a statement, according to the Honolulu Star-Advertiser. "Bruno is a shining example of how people in Hawaii step forward and take care of one another and we are grateful to him for his aloha and kokua." In addition to meaning hello and goodbye, the Hawaiian expression "aloha" also means love or compassion, while "kokua" signifies a sense of wanting to help others. The Hawaiian-born singer just wrapped up his "24K Magic" tour in his home state. Right before a concert on Friday night, Mars posted an adorable throwback photo of himself as a little boy wearing a "Hawaii" T-shirt and singing into a microphone. "I've missed you all and I can't wait to perform and sing on the island I call home," Mars captioned the photo. His love for the island was put on display again when he shared a video of the beautiful teal waters of an infinity pool leading out to the deeper blue ocean. Mars' family hung out backstage together while he performed on Sunday and one of his sisters, Tiara Hernandez, posted a cute photo on Instagram. Seeing family while he was in Hawaii was a given for Mars, but he hasn't always made it home in time for the holidays. In 2012, the singer was on the road on Thanksgiving Day. He shared a pretty depressing photo of an airport turkey sandwich on Instagram so being able to enjoy a real holiday meal with friends and family is something the singer appears to cherish as much as millions of people across the country do every year. The singer may have been spreading his "24K Magic" while on tour, but his turkey day donation shows that he has a true heart of gold — 24-karat gold, of course. Bruno Mars: Best wedding singer ever!